Private equity has evolved and is attracting increasing interest. Some 41 years ago, George Roberts, Jerry Kohlberg and Henry Kravis pulled together US$120,000 to form their first private equity (PE) fund. There were no such funds in those days and nobody else appeared to be doing what was then called leveraged buyouts. Little did they know that they were starting an industry. At the time, transactions were less sophisticated and many players saw their job as stripping down assets and flipping them for a profit. Investments are very different today. Rebranding into private equity, investment firms have become “active owners” that bring skills and expertise along with capital to add long-term value to their portfolio companies. “We’ve learned to think of ourselves as industrialists,” writes Henry Kravis in the foreword to my book, Mastering Private Equity: Transformation via Venture Capital, Minority Investments & Buyouts. To be successful today, PE firms have to think like transformation agents with an impact on the economy at large. PE firms are, indirectly, amongst the top 10 employers in the world. PE firms’ responsibilities and skills, as documented in the book, extend not only to the board room but to the shop floor and beyond. From governance to operations, PE funds are no longer just hands-off investors seeking to profit through financial engineering. My book, co-authored with Bowen White and Michael Prahl, both INSEAD alumni, takes an in-depth look at how today’s PE investors transform businesses and provides the following insights. Find your partner: Both boards of investee companies and PE firms must first do their own due diligence and find the partner that is best aligned with the management team’s skillsets, the company’s current development and its future plans. There are many options available for companies looking for a PE partner, ranging from venture capitalists to buyout specialists. Venture capitalists, for example, are minority investors betting on the future growth of early-stage companies that may not yet have profit, revenue or even a product in play. Occupying the space between venture and buyout investing, growth equity funds invest in fast-growing businesses, which have moved beyond the start-up stage, in exchange for minority equity stakes. Buyout funds represent by far the majority of global capital invested by PE funds, both today and historically. By acquiring controlling equity stakes, buyout investors are able to restructure the financial, governance and operational characteristics of their investee companies, as needed to drive value creation. Even for companies in distress, burdened by debt or struggling to make an operating model work, there exist alternative PE funds that specialise in turnarounds. Alignment of visions: PE funds perform well when they source deals in line with their area of expertise – giving them a better base from which to assess risks, opportunities and portfolio fit from the start – in addition to their industry know-how and value-add through networks and insights. Partnering with entrepreneurs and owners who have a common vision for the business and having the right management team in place is as important as rigorous financial due diligence. Active ownership: Clear plans and decisive management throughout the lifecycle of the investment are also crucial to ensure successful exits; these priorities are supported via PE’s “active ownership” model, which works particularly well in a controlled buyout setting. 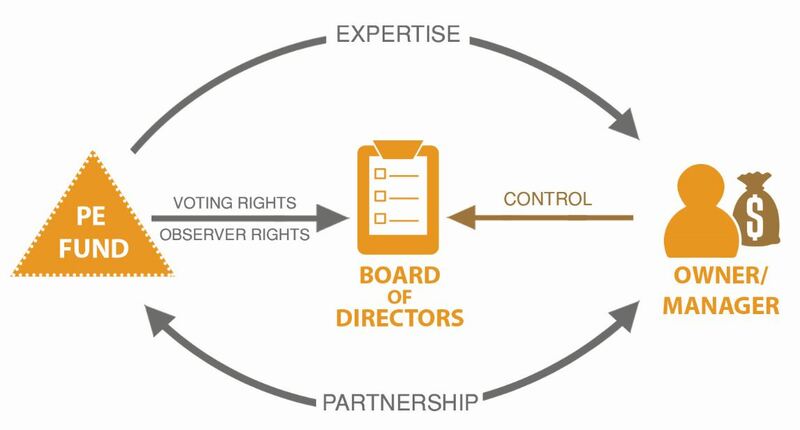 Active owners engage closely with their investee companies to shape strategy and management, monitor performance and provide feedback and coaching when appropriate. While the board of directors is the main channel through which PE investors influence the performance of portfolio companies, PE firms typically engage beyond the board to address specific priorities within company operations. They can deploy their expertise to add value, such as during mergers and acquisitions and refinancing situations. As a “repeat” player in these areas, PE firms bring domain expertise to their investee companies. Understanding the entire PE ecosystem is increasingly important for PE investors, board members and senior management teams alike. The historically low interest rate environment continues to put pressure on portfolio managers in their search for excess returns. Ignoring the investible universe of non-listed companies and focusing on public equities only is a luxury few can afford. Our research and data have shown that all limited partners (LPs) – but in particular large pension plans in the U.S. and Europe – will continue to be enthusiastic allocators to PE. Some are even finding ways to go direct, such as the Ontario Teachers’ Pension Plan in Canada, which has built its own internal expertise and capabilities to conduct PE deals. 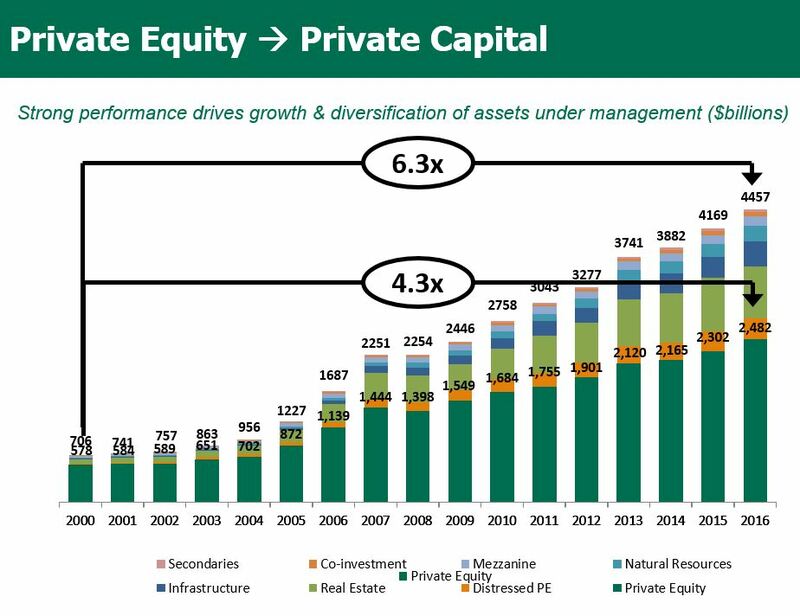 The increased interest in private equity as an asset class and the impressive returns shown in the last decade have led to the formation of an industry in its own right. PE assets under management (AUM) have more than doubled in the last five years, while venture capital AUM has more than tripled. When compared to the public markets, PE AUM has grown three times faster and regularly outperforms its public market competitors. This has even prompted Norway’s pension plan and Japan’s Government Pension Investment Fund, long holdouts, to finally add PE to their investible universe, and most LPs to increase their allocations to the asset class. The institutionalisation, maturation and success of PE has spurred offshoots, as LPs and general partners (GPs) seek to apply the PE investment model to different asset classes. Indeed, when combined with investments in infrastructure, natural resources, real estate, distressed PE, secondaries, co-investment and mezzanine funds, AUM has grown to US$4.5 trillion as of year-end 2016. Based on the current growth trajectory, the share of private capital in alternative strategies is likely to continue to expand. Coupled with overall demand for private market opportunities amid lackluster public market returns, PE funds are likely to continue to play an important role in getting capital and expertise to deserving companies. Claudia Zeisberger is a Senior Affiliate Professor of Decision Sciences and Entrepreneurship and Family Enterprise at INSEAD and the Academic Director of the school’s Global Private Equity Initiative. She is the co-author of the recently launched book, Mastering Private Equity: Transformation via Venture Capital, Minority Investments & Buyouts. A companion book, Private Equity in Action, takes the reader on a tour of the private equity investment world through a series of case studies written by INSEAD faculty and taught at the world's leading business schools. Will Late-Stage Venture Funding Pay Off?